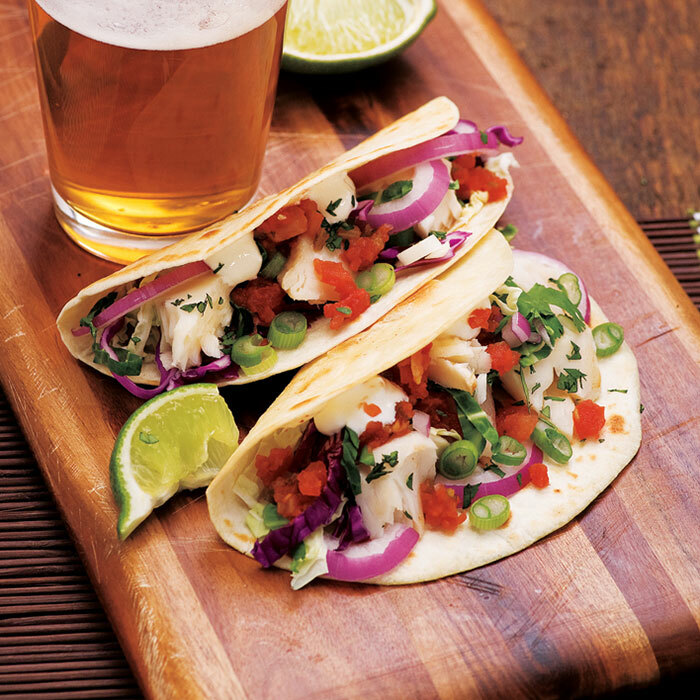 Turn Taco Tuesday into a fiesta of flavor with these bold fish tacos. In small bowl, mix lime juice, lime zest, garlic, jalapeño, sesame oil, cilantro, salt and pepper. Place fish in large zip-top plastic bag and pour lime juice mixture into bag. Refrigerate 1 hour. Prepare outdoor grill for direct grilling over medium-high heat. Tear 2 sheets of foil (each about 18 inches long). Place 1 sheet on work surface and spray center with nonstick cooking spray. Remove fish from marinade (discard all but 1 tablespoon), and transfer fish to center of foil. Pour reserved marinade and sprinkle red onion over fish; fold edges together several times to seal. Place packet on hot grill rack. Cover and cook 10 minutes. Carefully open 1 end to let steam escape, then open sides of foil packet. On microwave-safe plate, place tortillas between 2 damp paper towels. Heat in microwave oven on high 10 seconds or until tortillas are warmed. To serve, evenly divide cabbage, pico de gallo, sour cream, fish with red onion, green onions, and cilantro leaves if desired, over center of tortillas. Fold each in half to close.